This is Rubicon’s basic suspension lift for the YJ. The complete kit nets 4" of lift clearing 33x12.50", with an improved ride and articulation. 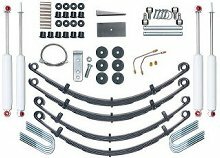 This system offers a complete and affordable option towards improving your Wrangler’s suspension. Drivers will be excited about the increased ride height, offroad performance and stellar on-road mannerism.